The alternative media have blogged and made countless YouTube videos, many of them subsequently taken down by YouTube censors, on what Wolfgang Halbig calls “things that don’t make sense” about the Sandy Hook Elementary School (SHES) shooting massacre of 20 first-graders and 6 adults on December 14, 2012, in Newtown, Connecticut. Some of those “things that don’t make sense” are emergency medical helicopters not being called to the scene, parents showing no grief, donation websites with creation dates that preceded the massacre, government’s continuing refusal to release the death certificates and burial sites of the alleged victims, and homes with a sale transaction date of 12/25/2009 and a $0 sale price. Was Sandy Hook Elementary School (SHES) operational on December 14, 2012, or had it long been abandoned? If the school already was closed, no children or teachers would be there on December 14 to be gunned down by Adam Lanza. SHES was built in 1956. Several reports in local newspaper The Newtown Bee indicate that years before the massacre, SHES was in a state of disrepair and contaminated with environmental toxins. On October 5, 2013, nearly 10 months after the massacre, a city referendum passed by over 90% in support of the demolition and rebuilding of SHES with a generous $49.25 million grant from the State of Connecticut. The reason given for the demolition was “asbestos abatement”. On Dec. 2, 2013, Newtown’s Public Building and Site Commission Chairman Robert Mitchell issued a report to justify the already-approved demolition. He said that “had the town decided to reoccupy the school on Dickinson Drive, it would have faced a daunting and possibly insurmountable challenge regarding the presence of hazardous materials” because the school was contaminated by not just asbestos, but also PCBs under the flooring and in the foundations and footings. Just think: If the city already knew in 2008 that the school was contaminated with asbestos and other environmental toxins and, in 2013, used the contamination to justify tearing it down, why would the same asbestos-contaminated school be safe for children and teachers to inhabit from 2008 through 2012? If SHES had remained open, wouldn’t the school district be sued for endangering public health? 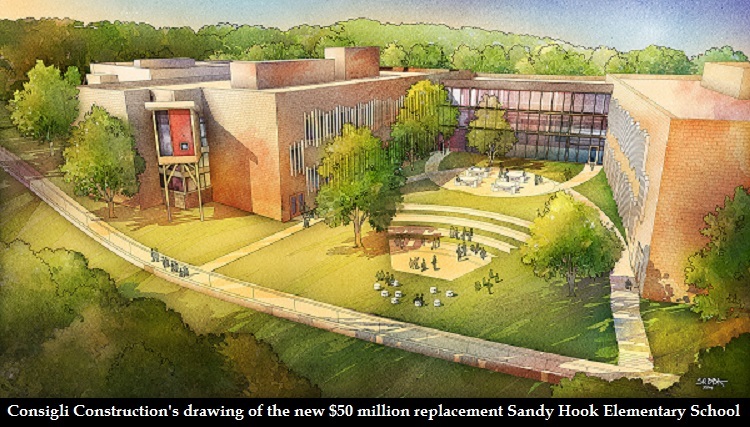 It makes more sense that the school was shut down in 2008 and remained closed, until the shooting provided Newtown with the financial means — a windfall of $50 million from the state — to tear down the school and build a swanky, state-of-the-art replacement. I have stated in previous posts that Sandy Hook Elementary School had long been closed before the “massacre” because it was contaminated with asbestos and other environmental toxins since 2002. Alas, the local newspaper Newtown Bee memory-holed its articles on the contamination. But this Newtown Bee article published a year after the “massacre” confirms the school was contaminated with “widespread haz-mat presence”. For the school to remain open would be to place its staff and students’ health and lives in danger, which would render the school vulnerable to lawsuits. Crime scene photos of the exterior and interior of SHES — from the website of the State of Connecticut’s Department of Emergency Services and Public Protection, and from a batch of photos that Halbig obtained via Connecticut’s Freedom of Information Act (FOIA), some of which are posted on James Fetzer’s blog — are consistent with the appearance of an abandoned school. 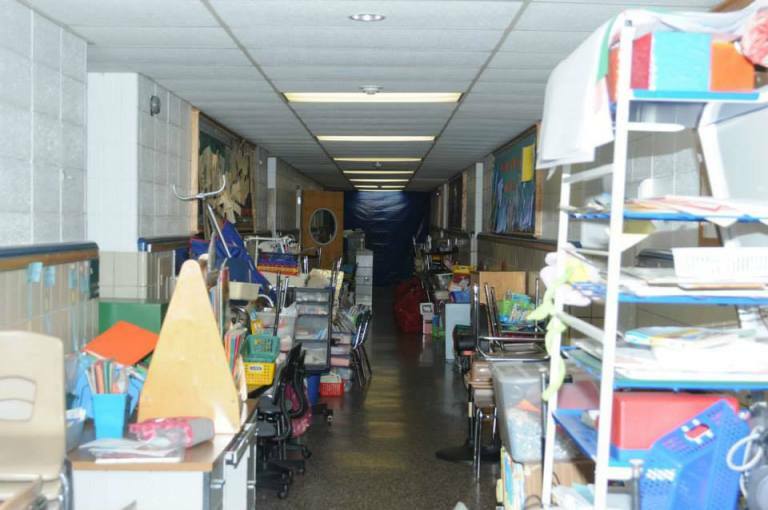 Classrooms and hallways were used for storage, jammed with furniture and office supplies. If those rooms and hallways were actually in an operational school, then SHES was in clear violation of the fire safety code. Then there is this photo of a pile of dust underneath an alleged bullet hole in a wall outside Room 1C, which looks suspiciously like the debris from someone drilling a pretend “bullet” hole into the ceramic wall-tile. But we don’t need crime scene photos for visual indicators of a long abandoned school. 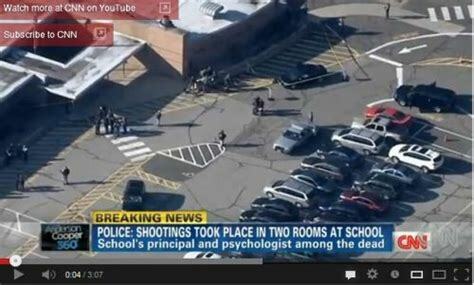 The many aerial photographic and video images of Sandy Hook Elementary School’s parking lot taken by news media on the day of the massacre would suffice, such as the one below from a CNN news video. Although the above CNN image shows a wheelchair symbol painted on a parking space closest to the school’s front door, it is not painted in the now-familiar blue and white colors that have become ubiquitous certainly by 2012. 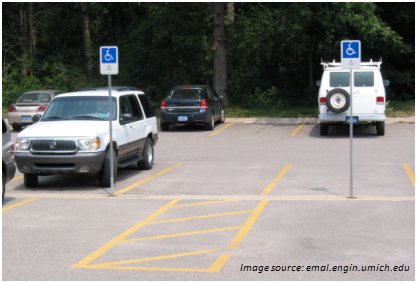 The international symbol of accessibility should be posted on all accessible parking spaces marking the reserved spot. The accessibility symbol is the well-known picture of a person using a wheelchair on top of a blue background. Van-accessible parking spaces to have additional ‘text’ or ‘sign’ below the accessibility symbol to mark the van-accessible area specifically. The picture below shows the upright handicap signs that should be, but were not, in SHES’s parking lot. But aerial images of SHES’s parking lot, including the CNN image, show no upright blue-and-white handicap signs nor blue-and-white colored handicap parking spaces, which would make the school in violation of the Americans with Disabilities Act of 1990 and the subsequent ADA Amendments Act of 2008 that broadened the meaning of disabilities. Unless, of course, the school had been closed since 2008. I believe the most compelling evidence that SHES had long been abandoned before the 2012 massacre is the testimony from the Internet Archive’s Wayback Machine of the school’s lack of of Internet activity from the beginning of 2008 through all of 2012. The Wayback Machine is a digital archive of the Internet which uses a special software to crawl and download all publicly accessible World Wide Web pages. It was Jungle Server who first discovered that the Wayback Machine shows an absence of Internet activity from SHES since 2008 — the same year when the school was found to be contaminated with asbestos. To verify Jungle Surfer’s claim, I searched for SHES’s website, https://newtown.k12.ct.us/~sh, on the Wayback Machine, the result of which is below, showing the school’s lack of Internet activity from the beginning of 2008 to mid-2013. By mid-2013, we are told SHES temporarily had relocated to the nearby town of Monroe, about 9 miles from Newtown. You are invited to replicate and verify what I did by going here. On April 24, 2015, more than two years after Halbig first asked questions about Sandy Hook by phoning and writing letters to Connecticut officials invoking the FOIA, the state finally granted him the first of two hearings before the State of Connecticut Freedom of Information Commission. The respondents were the Newtown Police Department, First Selectman Patricia Llodra, the Town of Newtown, and Newtown’s Board of Education. They were represented by attorney Monte Frank, a gun-control activist who founded Team 26, a cycling group that lobbies for gun control. 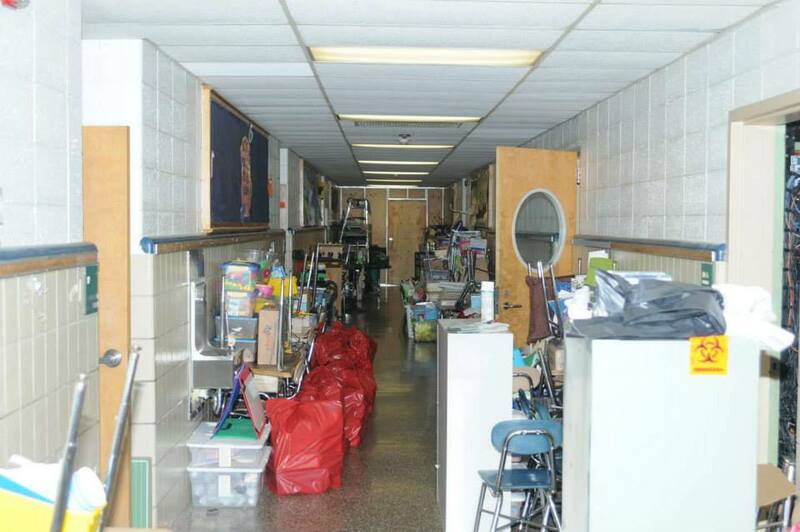 Copies of all maintenance work orders submitted by SHES principal Dawn Hochsprung (one of Lanza’s alleged victims who, strangely, was interviewed by The Bee about the massacre) or her designee to the school district maintenance department for any repairs, new classroom doors or painting from July 1, 2012 through December 13, 2012. Copies signed by Hochsprung or her designee showing the date of completion of the repairs together with time stamps showing job completion. Copies of all emails to and from Hochsprung and her assistant to various school district departments, e.g., food services provider, from May 1, 2012 through December 13, 2012. The requested documents presumably could prove that the school was operational on the day of the massacre. In a post on April 25, 2015, an anonymous contributor to SandyHookFacts.com, a blog that claims to debunk Sandy Hook “conspiracy theorists,” triumphantly crowed that the FOI hearing was a “total failure” for Halbig because attorney Frank said time-stamped SHES maintenance work orders signed by Hochsprung or her designee had been made available to Halbig six months before the hearing. Note that paragraph 2(a)(i) in the FOIC memo is 1A in this post (see above), i.e., copies of all maintenance work orders submitted by SHES principal Dawn Hochsprung or her designee to the school district maintenance department for any repairs, new classroom doors or painting from July 1, 2012 through December 13, 2012. Note that paragraph 2(a)(ii) in the FOIC memo is 1B in this post, i.e., copies signed by Hochsprung or her designee showing the date of completion of the repairs together with time stamps showing job completion. By saying that “the town had no records responsive to the request described in paragraph 2(a)(ii),” the FOIC means the town of Newtown does not have documents signed by Hochsprung or her designee showing the date of completion of the repairs [to SHES] together with time stamps showing job completion. Note that FOIC’s paragraph 2(b)(i) is document 2 in this post, i.e., copies of all emails to and from Hochsprung and her assistant to various school district departments, e.g., food services provider, from May 1, 2012 through December 13, 2012. In other words, Newtown cannot produce evidence that in the months preceding the massacre from May 1, 2012 through December 13, 2012, repairs were made on Sandy Hook Elementary School or that Hochsprung had exchanged emails with school district departments. The reason is a simple one: the school was not operational, having been closed down for years, most probably since 2008 when it was discovered to be contaminated with asbestos. 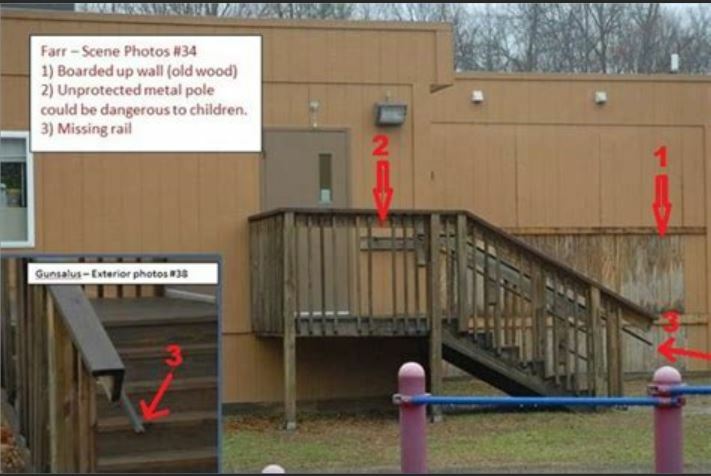 See “Wolfgang Halbig has stunning evidence that Sandy Hook Elementary School was closed months before ‘massacre” and “More evidence that Sandy Hook Elementary School had moved to Monroe, CT before the shooting massacre“. This entry was posted in conspiracy, crime, False flag, Gun Control/2nd Amendment, Liberals/Democrats/Left, Obama's America, Sandy Hook massacre, United States and tagged Connecticut General Statutes Sec. 14-253a(h), Connecticut state law on handicap parking spaces, Dawn Hochsprung, Jungle Server, Monroe CT, Monte Frank, Sandy Hook Elementary School had no internet activity since 2008, signs of Sandy Hook Elementary School being closed before massacre, State of Connecticut Freedom of Information Commission, Transmittal of Proposed Final Decision, Wayback Machine, Wolfgang Halbig, Wolfgang Halbig's FOI hearing. Bookmark the permalink. You guys are all wrong. 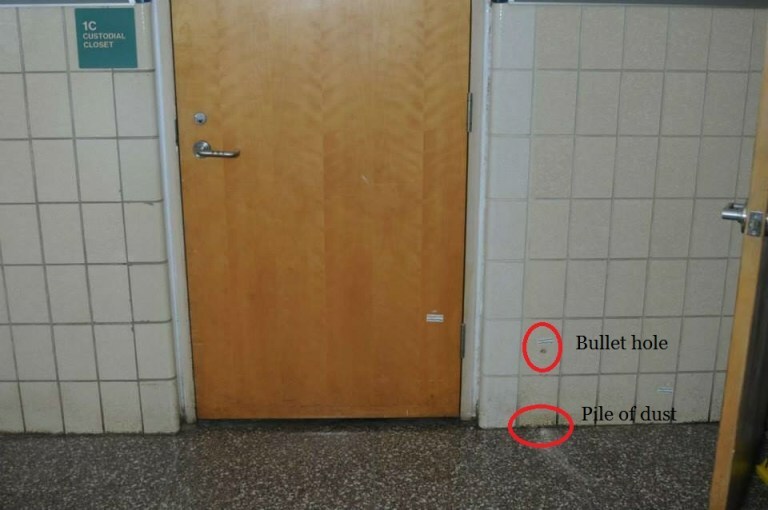 The sandy hook shooting was indeed real…. I was on the phone with my niece Michelle as she was driving the kids to the fire station to meet up with the parents. My nieces daughter stepped over his dead body and was in couceling for over a year. Emily was her best friend and she was killed. Please understand that this was real and a lot of people were affected by this travisty. This is all very interesting…..not sure what to think, But, I can believe is all was a hoax. Have to keep reading. If this was a hoax, and I believe it was by about 99%, there was an amazing amount of money paid to keep quiet. Now, you may remember that as of 2012, 3 trillion is missing/unaccounted for in the Dept. of Defense budget….so there. Obvious that the school was closed and the shooter was home all day playing video games. Later, he and mother had an argument and both were shot in the ensuing physical struggle. Read the police report and understand rather than speculate.